For other uses, see Lillooet (disambiguation). 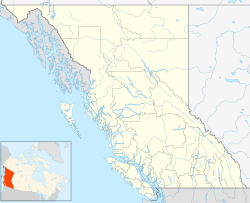 Lillooet (English: /ˈlɪloʊ.ɛt/), formerly Cayoosh Flat, is a community on the Fraser River in British Columbia, Canada, about 240 kilometres (150 mi) up the British Columbia Railway line from Vancouver. Situated at an intersection of deep gorges in the lee of the Coast Mountains, it has a dry climate with an average of 329.5 millimetres (13 in) of precipitation being recorded annually. Lillooet has a long growing season, and once had prolific market gardens and orchard produce. It often vies with Lytton and Osoyoos for the title of "Canada's Hot Spot" on a daily basis in summer. Lillooet is an important location in Aboriginal history and culture and remains one of the main population centres of the St'at'imc (Lillooet Nation), and today it is one of the southernmost communities in North America where indigenous people form the majority. Just over 50 per cent of the people in Lillooet and area are St'at'imc. First Nations communities assert the land as traditional territory since time immemorial. Considered to be one of the oldest continuously inhabited locations on the continent, the area is reckoned by archaeologists to have been inhabited for several thousand years. The immediate area of the town attracted large seasonal and permanent populations of native peoples because of the confluence of several main streams with the Fraser and also because of a rock-shelf just above the confluence of the Bridge River which is an obstacle to migrating salmon. Many archaeological and heritage sites are in the vicinity of the town, including Keatley Creek Archaeological Site, one of the largest ancient pit-house communities in the Pacific North West. This rock shelf, known in gold rush times as the Lower Fountain, was reputedly made by the trickster Coyote, leaping back and forth across the river to create platforms for people to catch and dry fish on. This location, named Sat' or Setl in the native language and known as the Bridge River Rapids or Six Mile in English, is the busiest fishing site on the Fraser above its mouth and there are numerous drying racks scattered around the banks of the river canyon around it. The Hop Farm neighbourhood in Lillooet. 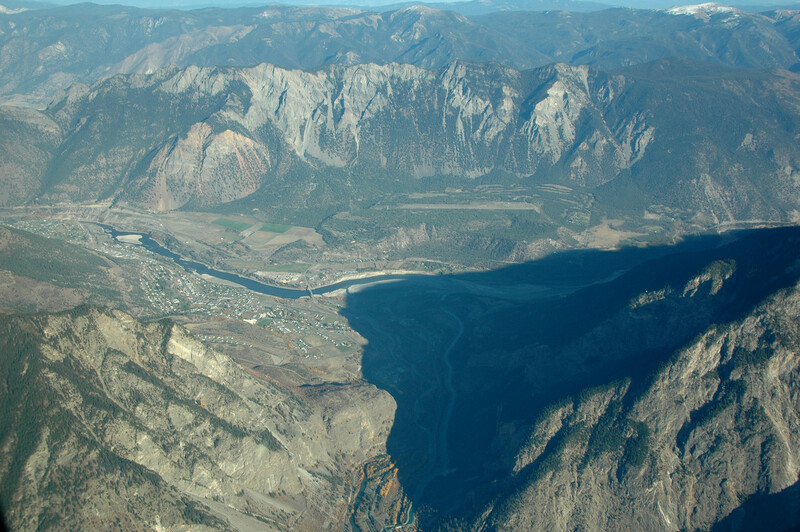 The town had its start as one of the main centres of the Fraser Canyon Gold Rush of 1858–59, during which it was reckoned to be "the largest town west of Chicago and north of San Francisco", a title also held by certain other towns in British Columbia in rapid succession (Yale first, Barkerville after). Just after this gold rush, the town's layout as it is today was surveyed by the Royal Engineers and its Main Street tied into the original Cariboo Wagon Road or Old Cariboo Road to Fort Alexandria, a huge project undertaken as a toll road by Gustavus Blin Wright, one of the many entrepreneurial personalities of the early colony. Much of its tortuous canyon-brink road grade for twenty or thirty kilometres from "Mile 0" remained in use until the 1970s. The route via the lakes to Lillooet and up Blin Wright's wagon road to the Cariboo goldfields was outflanked within a few years by the now-better known Cariboo Wagon Road via a shorter and less portage-intensive route from Yale to Barkerville via Ashcroft a few years later. Lillooeters still, however, consider their town to be "Mile 0" of the original Cariboo Wagon Road, and it is true that the numbered roadhouse names of the Cariboo district are measured from the bend in Main Street, where a cairn was erected to commemorate this fact. The first stretch of Main Street north from the cairn is said to point due north and at one time was called "the Golden Mile" partly because of all the gold dust reputed to be scattered along it in its heyday, and also because it was the hub of supply for the surrounding goldfields. Lillooet was originally named Cayoosh Flat, a name that was felt to be unsavoury by the residents of the town at the time of its incorporation in 1860. Since it was at the end of the Lillooet Trail, aka the Douglas Road or Lakes Route, and the Lil'wat native people farther southwest along that route spoke the same language as the native bands near town, the governor was petitioned to change the name to Lillooet, with permission for use of the name granted by the chiefs of the Lower St'at'imc at Mount Currie (Lil'wat) and agreed to by the bands of what is now the Upper St'at'imc. There have been a series of gold rushes in the surrounding region since the original one, including a large hard-rock one in the upper Bridge River Country which began in the 1880s and 1890s but had its peak from the 1930s to the 1950s, focussed on two main mining towns at Bralorne and adjacent Pioneer Mine and that area's main base town of Gold Bridge. Gold mining and prospecting continues in the area to this day, as do prospects for copper, silver and nephrite jade, though not to the same extent. Until the discovery of even larger deposits of jade near Cassiar, the Lillooet area was the world's largest source of the nephrite form of jade. Unknown tonnes were exported to China before government assayers discovered the nature of the "black rocks" that the Chinese miners found so interesting. In the 1950s, local farmer and teacher Ron Purvis adapted the skil-saw concept by implementing a diamond rotary blade. This enabled the carving of the many immense jade boulders which line the banks and bed of the Fraser and Bridge Rivers, which were on the one hand immovable and on the other would shatter or striate if blasting was used to break them. Purvis' innovation was revolutionary in the jade mining business and larger versions of his saw are at use in the Cassiar region. There are no major commercial jade mines in the Lillooet area today, although local shops still carry polished jade souvenirs. The Golden Cache Mine located on Cayoosh Creek just West of Lillooet was believed to hold one of the richest ore bodies of gold until lack of results ended investment, though it started a local prospecting boom with various miners and companies continuing the search for rich veins around the region. Most in town for the "Golden Cache boom" headed for the Klondike or Atlin by 1900. There are a number of Japanese-Canadian families in Lillooet today who are descendants of those who remained in the area after their forced relocation to Lillooet and other nearby camps at Shalalth, Minto City and McGillvray Falls during World War II. The Lillooet Railway Station is a former BC Rail Station. The station is served at least once a day by the Kaoham Shuttle. There was formerly a service to North Vancouver, the Cariboo Prospector, but it was discontinued in 2002. South of Lillooet is Lytton (62 km) and Hope (173 km). West of Lillooet is Pemberton (99 km), Whistler (122 km), Squamish (175 km), and Vancouver (247 km). 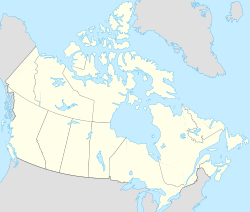 East of the town is Cache Creek (83 km), Clinton (102 km), Kamloops (167 km), and Prince George (518 km). Lillooet experiences a warm-summer humid continental climate (Köppen climate classification Dfb) that falls near the borderline with both the hot summer humid continental climate type (Köppen Dfa) and the semi-arid climate type (Köppen BSk). Lillooet (along with Lytton) holds the record for the hottest temperature recorded in British Columbia. On 16 and 17 July 1941, the temperature reached 44.4 °C (112 °F). In addition to the hottest July temperature, the town also holds the record for the hottest temperature recorded in the province during the months of April (36.1 °C or 97 °F), May (41.7 °C or 107 °F), and December (22.2 °C or 72 °F). The coldest temperature recorded was measured at the airport during a November cold snap in 1985. With an average annual snowfall of 26.5 cm, Lillooet is the least snowy place in the BC Interior. In the 2011 Census, Statistics Canada originally reported that Lillooet had a population of 2,322 living in 1,068 of its 1,181 total dwellings, a -0.1% change from its 2006 population of 2,324. Statistics Canada subsequently amended the 2011 census results to a population of 2,321 living in 1,067 of its 1,178 total dwellings, a -0.1% change from 2006. With a land area of 27.51 km2 (10.62 sq mi), it had a population density of 84.36984.4/km2 (218.516218.5/sq mi) in 2011. Lillooet has an estimated trading area of 5,000. The regional population includes that of the three large bands of the St'at'imc or Lillooet Nation whose reserves abut the town on all sides, and another three large reserves within 20 miles (32 km); 430 of the District of Lillooet's population are aboriginal. Historical populations have included large numbers of Americans and Chinese, although there are few of either today (although many longtime local families, First Nations and non-First Nations, have some bloodlines from both). The town's non-native population has been historically multi-ethnic in extraction, with a relatively high-rate of intermarriage between all groups. Its economy was historically based around logging, the railway, ranching, farming, and government services. The town has had several booms and busts, relying on forestry since the mid-1970s although previous booms were connected with Fraser Canyon and Cariboo Gold Rushes, the building of the Lillooet Cattle Trail, another gold rush adjacent to town in the 1880s and another nearby in the Pacific Great Eastern Railway, and spinoffs from the development of the Bridge River goldfields from the 1910s onwards. Lillooet's economy also boomed in the 1940s and 50s during the construction of the Bridge River Power Project, which includes a dam, canal and powerhouse on the outskirts of town. A new industry emerging in the area is wine, which was eyed early on by an Italian named Savona, for whom the town of Savona is named. His original vines were in the area of Fountain and were the first attempt at commercial wine-growing in British Columbia. Fort Berens Winery, located in East Lillooet across the Fraser from the main town, is a relatively new venture but has won several awards, and its winery includes a new museum of local crafts. A new winery at Cedar Falls, near Texas Creek about 20 km south of town on the west side of the Fraser, has been doing test plantations and will be commercially producing soon. Lillooet has one high school, Lillooet Secondary, which also serves students from rural localities outside the town such as Shalalth, Seton Portage, Gold Bridge and Bralorne although those communities do offer students a Secondary School program. 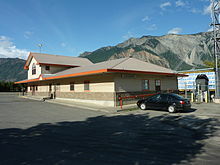 Cayoosh Elementary School is located in the Cayoosh Heights subdivision and George M. Murray Elementary serves those in North Lillooet. The Upper St'at'imc Culture, Language and Education Society (USCLES) operates education programs, but most St'at'imc children attend the public school system. Post-secondary programs are offered by Thompson Rivers University located at 155 Main Street. The Fountainview Academy Association operates Fountainview Academy, an international private school, which offers work-study experience that includes organic farming, and is about 24 km south of Lillooet on British Columbia Highway 12. Ernest Carson, MLA for Lillooet (and Lillooet West) and provincial Minister of Work. Son of Robert & Eliza Jane Carson. Don Dickinson - Canadian writer and teacher. He was shortlisted nominee for the Governor General's Award for English-language fiction at the 1991 Governor General's Awards for his short story collection Blue Husbands, and for the 1993 Books in Canada First Novel Award for his novel The Crew. Blue Husbands was also a winner of the Ethel Wilson Fiction Prize in 1992. ^ "British Columbia Regional Districts, Municipalities, Corporate Name, Date of Incorporation and Postal Address" (XLS). British Columbia Ministry of Communities, Sport and Cultural Development. Archived from the original on 13 July 2014. Retrieved 2 November 2014. ^ a b c "Population and dwelling counts, for Canada, provinces and territories, and census subdivisions (municipalities), 2011 and 2006 censuses (British Columbia)". Statistics Canada. 30 January 2013. Retrieved 15 June 2013. ^ a b c "Corrections and updates". Statistics Canada. 21 March 2013. Retrieved 15 June 2013. ^ BCGNIS listing "Cayoosh Flat"
^ "Hottest Places in Canada". Current Results Nexus. Retrieved 21 June 2013. ^ "Station Results - Advanced Search". weatheroffice.gc.ca. Archived from the original on 13 May 2013. Retrieved 14 October 2015. ^ a b "Community Profiles from the 2006 Census, Statistics Canada - Census Subdivision". statcan.ca. 13 March 2007. Retrieved 14 October 2015. ^ The Newspapering Murrays, Georgina Keddell, self-publ. ^ "Fountainview Academy Association". CHIMP. Retrieved 29 July 2018. Wikivoyage has a travel guide for Lillooet. Lillooet during "The July", c.1898 Caption says "Hunters in front of Phair's Store" but this is clearly the horseraces during the Big Hiyu. This page was last edited on 27 February 2019, at 06:15 (UTC).